For sale is a pair of USA MADE hog ring pliers for closure of 3/8" to over 1" OD hog rings. These pliers are of exceptional quality and will last for generations. An internal spring holds the hog ring in place, so you can set them down while positioning the work piece, without dropping the ring. Galvanized steel with PVC coated handles. These do have a break-in period in which they may get stiff until they are worked free. If you encounter problems with them, please let us know. Thanks for looking! 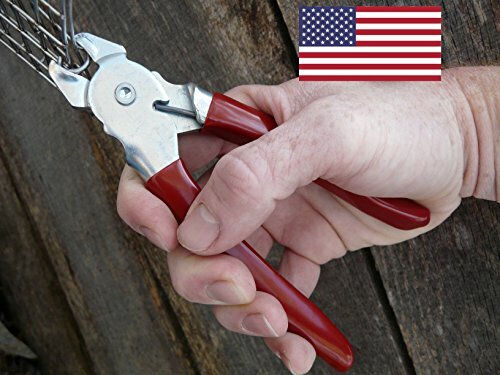 Made in the USA from thick galvanized steel, guaranteed pot metal free!